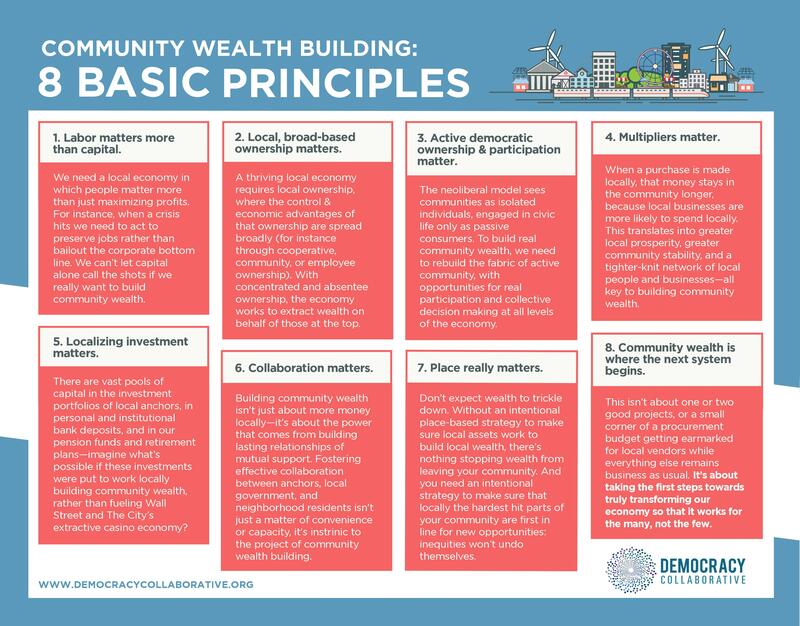 Based on Ted Howard's remarks to the recent Alternative Models of Ownership conference, the Democracy Collaborative has distilled the eight basic principles behind community wealth building—a transformative approach to local economic development—into this handy one page guide. 1. Labor matters more than capital. We need a local economy in which people matter more than just maximizing profits. For instance, when a crisis hits we need to act to preserve jobs rather than bailout the corporate bottom line. We can’t let capital alone call the shots if we really want to build community wealth. 2. Local, broad-based ownership matters. A thriving local economy requires local ownership, where the control & economic advantages of that ownership are spread broadly (for instance through cooperative, community, or employee ownership). With concentrated and absentee ownership, the economy works to extract wealth on behalf of those at the top. 3. Active democratic ownership & participation matter. The neoliberal model sees communities as isolated individuals, engaged in civic life only as passive consumers. To build real community wealth, we need to rebuild the fabric of active community, with opportunities for real participation and collective decision making at all levels of the economy. When a purchase is made locally, that money stays in the community longer, because local businesses are more likely to spend locally. This translates into greater local prosperity, greater community stability, and a tighter-knit network of local people and businesses—all key to building community wealth. There are vast pools of capital in the investment portfolios of local anchors, in personal and institutional bank deposits, and in our pension funds and retirement plans—imagine what’s possible if these investments were put to work locally building community wealth, rather than fueling Wall Street and The City’s extractive casino economy? Building community wealth isn't just about more money locally—it's about the power that comes from building lasting relationships of mutual support. Fostering effective collaboration between anchors, local government, and neighborhood residents isn't just a matter of convenience or capacity, it's instrinic to the project of community wealth building. Don’t expect wealth to trickle down. Without an intentional place-based strategy to make sure local assets work to build local wealth, there’s nothing stopping wealth from leaving your community. And you need an intentional strategy to make sure that locally the hardest hit parts of your community are first in line for new opportunities: inequities won’t undo themselves. 8. Community wealth is where the next system begins. This isn’t about one or two good projects, or a small corner of a procurement budget getting earmarked for local vendors while everything else remains business as usual. It’s about taking the first steps towards truly transforming our economy so that it works for the many, not the few.